A female super spy isn't entirely a new idea. We've seen a few of them throughout the years. One thing, none of them have been is very good. Sure Tomb Raider and Wanted could be argued that they have some redeeming qualities, but when I think female spies, I instantly get a bad taste in my mouth. Mainly due to the dribble that is Charlie's Angels. 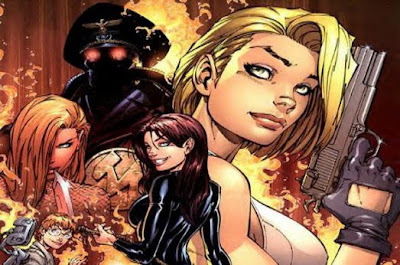 Luckily producer Adrian Askarieh tells the L.A. Times Hero Complex division that "Danger Girl" will be the "Anti-'Charlie's Angels.'" The producer who is also currently working on "Kanye and Lynch," "Leonardo da Vinci and the Soldiers of Forever" and "Hack/Slash" said something we are beginning to hear all too often. "We are taking these characters very seriously; a kind of "Batman Begins" approach, if you will." I'm really starting to hate hearing that comparison. Hollywood needs to stop. Can't they just say realistic? There is not a just add water recipe for comic book movies. Gripes aside, Askarieh explains that director Todd Lincoln, himself and producer Daniel Alter were all big fans of the comic and want to do the series justice. Askarieh says he would compare their vision to, ""Kill Bill" meets "Raiders of the Lost Ark" with the "team" element of "Mission: Impossible."" I have to say, Askarieh is making all the right comparisons there. I can see what he is gunning at, but something just keeps bringing me back to Charlie's Angels and how I fear this film could end up. Askarieh went on to tell Hero Complex that director Todd Lincoln is looking to utilize some of the same technology in Avatar. Askarieh calls Lincoln's vision, "A hyper-stylized, hyper-action action film, but with a heart and with characters you care about." As far as how soon we will get to see "Danger Girl" in theaters is yet to be determined. Askarieh hopes to have a big announcement in time for San Diego Comic Con, but he's not setting anything in stone. He said, "These things always take a bit longer than one anticipates." One thing that outside of tone and script that can make or break "Danger Girl" is the cast of vixens. This is dangerous waters. Relativity are gonna need to think long and hard about who they cast. A prime example would be Megan Fox. If she were to be cast, this flick is done. It will be Charlie's Angels. There is no if's or but's about it. Fox is a terrible actress, sure she's easy on the eyes, but she would cancel out all of the positives this film could hold. But hey that's just my two cents, I know damn well there are many who would disagree with me and would be willing to throw down money to see Megan Fox in more tiny outfits.